The recommended version of tmux to use is 1.8. Your mileage may vary for earlier versions. Refer to the FAQ for any odd behaviour. Download the appropriate completion file from the repo and source the file. The following are example where the completion file has been downloaded into ~/.bin. A working knowledge of tmux is assumed. 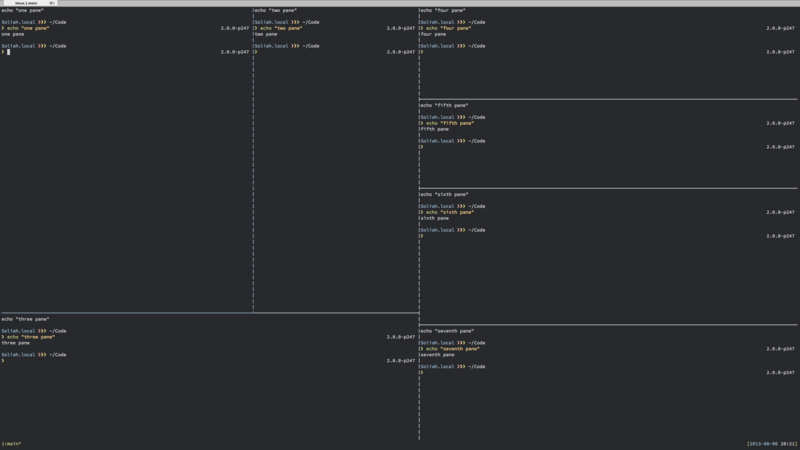 You should understand what windows and panes are in tmux. If not please consult the man pages for tmux. The windows option allows the specification of any number of tmux windows. Each window is denoted by a YAML array entry, followed by a name and command to be run. This takes precedence over the main root option. Note that if you wish to use panes, make sure that you do not have . in your project name. tmux uses . to delimit between window and pane indices, and tmuxinator uses the project name in combination with these indices to target the correct pane or window. Panes are optional and are children of window entries, but unlike windows, they do not need a name. In the following example, the editor window has 2 panes, one running vim, the other guard. The layout setting gets handed down to tmux directly, so you can choose from one of the five standard layouts or specify your own. To use tmuxinator with rbenv, RVM, NVM etc, use the pre_window option. These command(s) will run before any subsequent commands in all panes and windows. You can set tmuxinator to skip auto-attaching to the session by using the attach option. You can also run arbitrary commands by using the post option. This is useful if you want to attach to tmux in a non-standard way (e.g. for a program that makes use of tmux control mode like iTerm2). tmuxinator passes commands directly to send keys. This differs from simply chaining commands together using && or ;, in that tmux will directly send the commands to a shell as if you typed them in. This allows commands to be executed on a remote server over SSH for example. You can also pass arguments to your projects, and access them with ERB. Simple arguments are available in an array named @args. You can also pass key-value pairs using the format key=value. These will be available in a hash named @settings. This will fire up tmux with all the tabs and panes you configured. If you use the optional [alias] argument, it will start a new tmux session with the custom alias name provided. This is to enable reuse of a project without tmux session name collision. If there is a ./.tmuxinator.yml file in the current working directory but not a named project file in ~/.tmuxinator, tmuxinator will use the local file. This is primarily intended to be used for sharing tmux configurations in complex development environments. A shorthand alias for tmuxinator can also be used. Window names are not displaying properly? To contribute, please read the contributing guide. Copyright (c) 2010-2014 Allen Bargi, Christopher Chow. See LICENSE for further details. Generated on Mon Apr 1 23:57:48 2019 by yard 0.9.19 (ruby-2.5.1).